Unfortunately, there is another obstacle - if this drive is currently in use by another program. It's not possible to restore a system drive while it's in use, you have to restore it from DOS. This is similar to tools like FORMAT or CHKDSK /F. Other drives can be restored from windows, as long as they aren't currently in use. If you see the dialog above, some other program is currently accessing it; please click Show Processes and Handles, to list these programs. (above, it's the explorer and the command line window). For Windows NT you have to manually stop these programs, or change to a different drive. 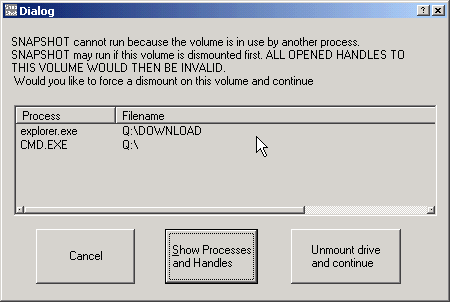 For Windows2000 and XP, you have the option to unmount the drive; all opened handles to this drive are invalid then. Click Unmount Drive and Continue to continue in this case.